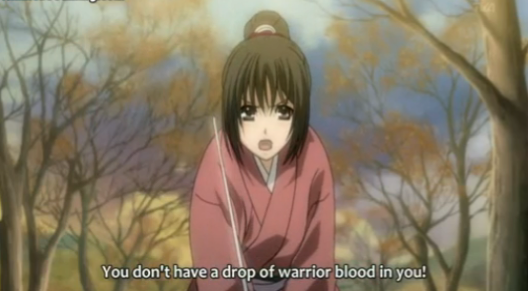 Chizuru tells it like it is. Episode 12 is the final episode of season 1 of Hakuouki. Unfortunately for the Shinsengumi, whose situation has been deteriorating over the past few episodes, things get dramatically worse. The distribution of modern weaponry amongst their enemies increases, and the oni prove to be even more powerful. On top of this, former allies are switching sides, and the Shogun has abandoned them, having fled to Edo. 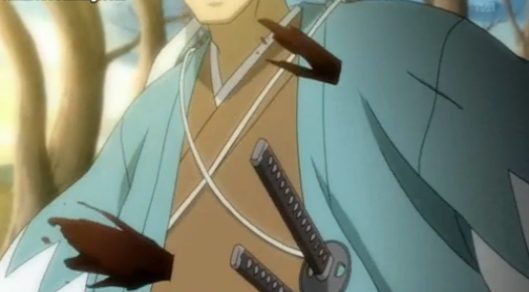 The Shinsengumi have no match for modern weapons. In summation, I enjoyed this series, which met my expectations in terms of consistently good, if not great artwork, and really interesting history. The pacing seemed well handled, building for most of the series towards this final episode, which featured probably the best fight sequence of the series. As expected, the focus of the series was less on the swordplay itself, and more upon the political instability that characterized the period, and the tragic stand of the Shinsengumi against the changing times. I also thought the ending was pretty good, given that a second season has been promised for the Fall. 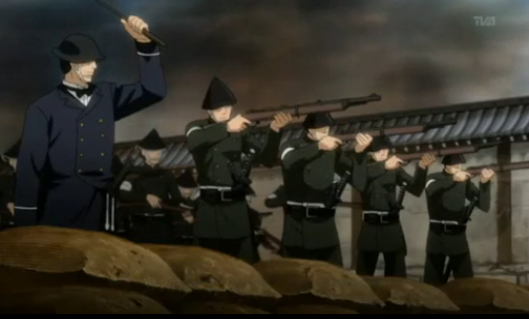 As this episode opens, the Battle of Toba-Fushimi has begun (January 1868). We see the increasing westernization of the opposing military forces, who have been armed with rifles and cannons (according to historical sources, they even had a Gattling gun). The Shinsengumi fight, but in vain. Losses are severe, and it becomes clear that they can’t hold out without reinforcements. 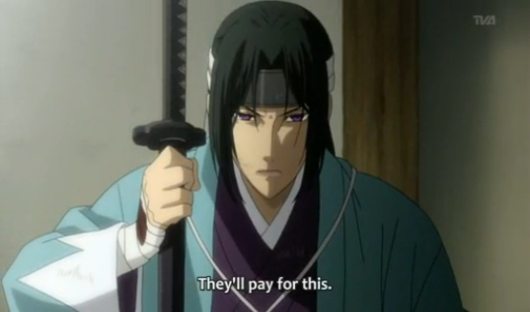 Hijikata is starting to realize that the age of sword and spear has passed. Chizuru and Genzaburou Inoue head to an allied outpost to request reinforcements. As they approach the gate, they are fired upon. Turning back, they encounter more treachery from former allies, who kill Inoue. The oni leader, Chikage Kazama kills those threatening Chizuru, but when Toshizo Hijikata sees Kazama and the corpse of Inoue he flies into a rage with disastrous consequences. Hijikata has been cold and stern through most of this series. The deteriorating situation seems to have sent him over the edge. Uncharacteristically passionate, he charges Kazama. His fight against Kazama takes on allegorical significance. Hijikata is fighting the oni who mocks him for being merely human, but his anger is also directed against the rifle and cannon that enable lesser men to take their lives casually and from a distance. Even deeper, his rage seems directed against the changing times, which mock his whole notion of true warriors who dedicate themselves to a strict code of ethics (bushido). Already enraged beyond reason, Hijikata faces Kazama who assumes his full power by revealing his true oni form. Refusing to back down, even against an unstoppable foe, he consumes the ochimizu. 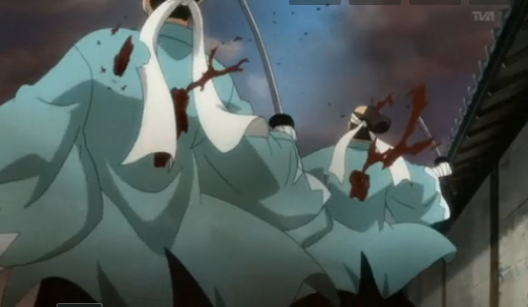 This was some of the best handled fighting action of whole series. It ends on a particularly tragic note. Yes, this is a burial at sea. The Shinsengumi discover that Yoshinobu Tokugawa, the last Shogun, has fled from Kyoto. 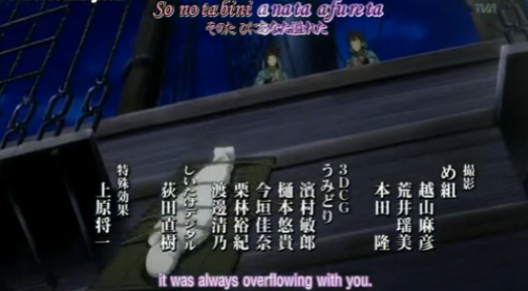 Without supplies, modern armaments, or hope for reinforcements, the Shinsengumi board a ship for Edo. The season ends with them burying one of the main members at sea, and questioning if their fight, and the deaths of their friends were without meaning. This was a fairly bleak, but poignant, way of ending things, and the Boshin War has only begun. Season Two of Hakuouki is expected to begin in October; I’m looking forward to it. This episode really was difficult to watch in some ways, with it becoming clear that the Shinsengumi were being outmatched and left behind by changing times and technology. I think your analysis of Toshizo’s rage and what was behind it is exactly right: he’s not just angered by Kazama, but by the guns and the fact that bushido was no longer the code that Japanese soldiers lived by. I’ll be watching the second season this fall, too. Yeah, we don’t usually get tragic anime; usually, no matter how dark things get for the protagonists, they are able to triumph in the end. Hakuouki doesn’t allow us that. I suppose the nature of the story of the Shinsengumi, at least in Japanese culture, is the loss of a time when self sacrifice was common and idealism was respected over pragmatism. This was a good series that was pretty much consistent to its expectations. 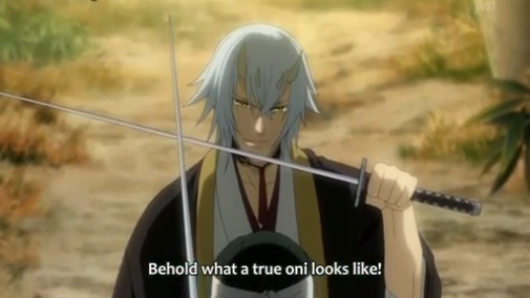 Though it was surprising that Hijikata actually drank Ochimizu to become an Oni. 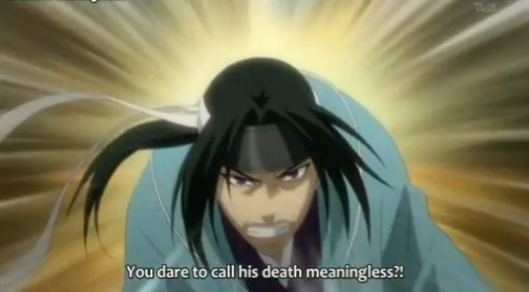 Though, he would be an exceptional one like Okita and unlike Sannan. I was so banking on Chizuru to awake her Oni powers and get over the damsel in distress mode but oh well, at least there’s a second season. I wonder if they were saving Chizuru’s “awakening” for the second season. I generally have cut her some slack, because I figure that is just the kind of character she is (besides it would be awkward if she outshone the historical figures), but I have to admit she could use a power-up.